Following the discovery of Edward Jenner, the Royal Jennerian Society was formed at the London Tavern on January 19, 1803. Under the patronage of the Prince and Princess of Wales, the society's goal was to promote the eradication of smallpox through vaccination. 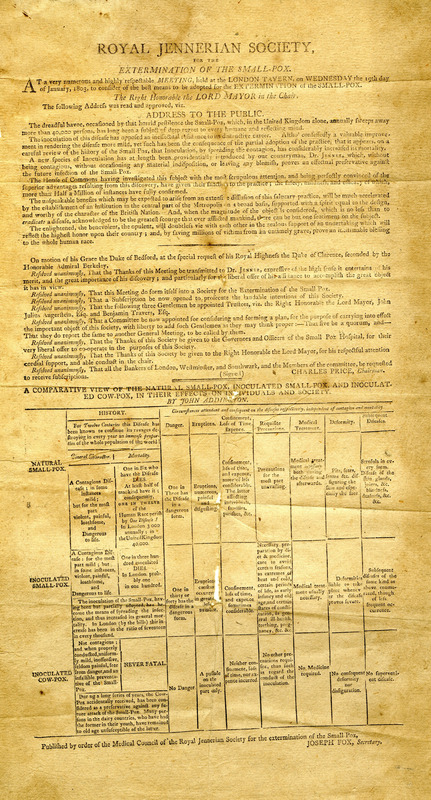 This rare broadside announces the formation of the society and encourages the officials of other cities and towns to adopt similar measures. Royal Jennerian Society, “Royal Jennerian Society for the Extermination of the Small-pox,” OnView: Digital Collections & Exhibits, accessed April 22, 2019, http://collections.countway.harvard.edu/onview/items/show/13019.